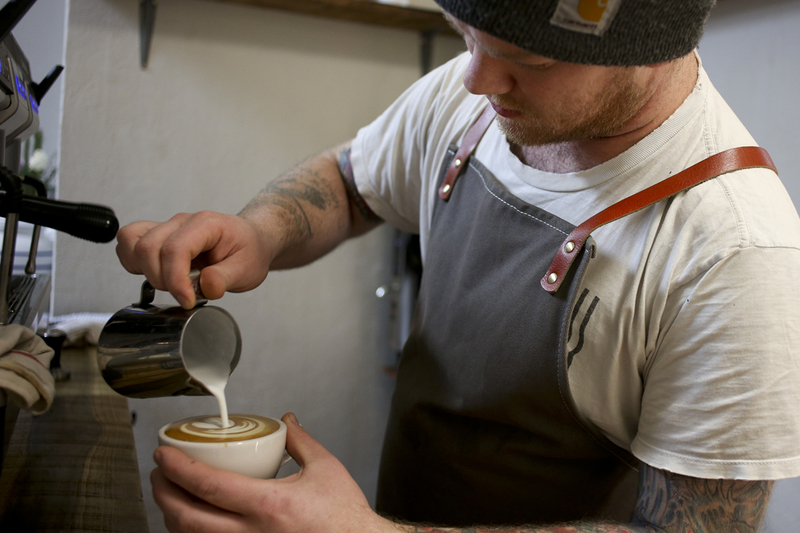 Braden Walter Jr. was driving to Espresso A Mano — where he worked as a barista — on a Sunday morning in February 2015. It was a normal day. Until his car slid into a telephone pole on Butler Street. At least, he thinks it was a telephone pole — his memory of the crash is hazy at best. Mary Gonzales, Walter’s wife, said she went to the scene of the crash to see the damage done to the car. Walter cracked his pelvis in two and underwent surgery to place bolts in his hip before spending a couple weeks in the hospital, a month in bed and three or four months away from work. For a barista, three months out of work simply isn’t manageable financially, according to Gonzales. When the “coffee community” heard about Walter’s accident, they banded together to make sure Walter was taken care of. Matt Gebis, a 2005 Pitt alum and the owner and founder of Espresso A Mano, said that by the time evening rolled around on the day of Walter’s crash, a GoFundMe page was already up and running. The page raised enough money to support Walter and his family for three months. As support rolled in, Walter and Gonzales began to understand that the connections Walter had made with customers and regulars were about more than just a daily caffeine fix. It was then that Walter realized he wanted to spend the rest of his life in the coffee business. A year later, in early 2016, Walter and Gonzales took a major step toward that goal. The couple bought a 1969 food truck with an odometer that had already logged about 700,000 miles. Over the course of six months, they rebuilt and revamped the truck into Redhawk Coffee Truck, which they debuted on the streets of Pittsburgh in September. After getting accustomed to grinding coffee beans and steaming milk in the back of a truck, Walter is ready for something more stable. On Dec. 30, 2016, Walter and Gonzales opened a brick and mortar coffeehouse on Meyran Avenue under the same name as their truck — Redhawk. The coffeehouse is operating as a pop-up shop and an extension of the truck, as Walter and Gonzales signed a lease only until March. During this time, the shop will be closed on Sundays but open every other day of the week from 6 a.m. to 6 p.m. Redhawk has a full espresso bar and will also serve homemade pie and biscuits from Food Glorious Food. Friday, at the shop’s grand opening, they will also have tacos from 11 a.m. to 2 p.m. from Baby Loves Tacos. Just as they weren’t sure what to expect with their truck until they got up and moving, the couple isn’t exactly sure what to expect with their brick-and-mortar shop. The physical shop will be the only independently owned coffeehouse in the Oakland neighborhood, after other non-chains — such as Beehive — moved out and chains like Starbucks, Crazy Mocha and Dunkin’ Donuts moved in. Gebis said he believes one of the reasons there aren’t independent coffee houses in Oakland already is because people assume the cost of rent will be too high in the University-centered neighborhood. “I would venture to say that probably a big part of it is that people just assume that it’s Oakland and because Pitt owns a lot of Oakland, people just assume that it’ll be cost-prohibitive,” Gebis said. Walter views the coffeeshop void as an untapped market and a chance to make his shop stand out from the crowd. “I don’t want to have coffee that you can go drive five minutes and go get it from another shop. I want to have coffee that people can come in just specifically to try that they’ve never had a chance to try before,” Walter said. One of Walter’s goals is to make an outstanding cup of coffee and to use beans from a number of different roasteries, both local and outside of Pennsylvania. “A lot of shops have one roaster, but I’m just making a shop that I would want to go to, and that would be a shop that has lots of options,” Walter said. On the truck, Walter primarily used beans from Commonplace Roastery, which is based in Pittsburgh. For the shop, however, Walter and Gonzales have tried out beans from a number of local and out-of-town roasteries, including Passenger Coffee, Panther Coffee, Dogwood Coffee and Four Barrel Coffee. The beans aren’t the only difference between Redhawk’s truck and the shop — at the shop, Walter hopes to build up a base of regular customers he can get to know.